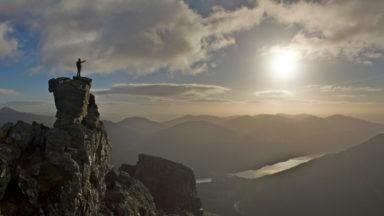 Scotland is a mountainous country with a wide variety of wild landscapes: there are the rolling hills of the Southern Uplands, the great granite plateaus of the Cairngorms, the steep castellated rock peaks of Torridon and the jagged narrow arêtes and spires of the Cuillin hills on the Isle of Skye. 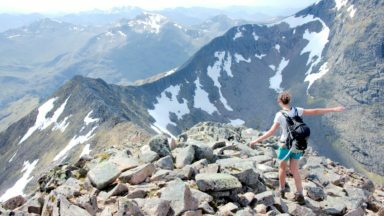 Of the many majestic summits, 284 reach 3000ft or more; these are the Munros, the ascent of which is the aim of many walkers. Below them lie splendid pine forests, beautiful lochs, deep glens, rushing rivers; a magnificent landscape. A summary box at the end of each chapter gives information on access and accommodation plus recommended maps, guidebooks and other relevant literature. Page 96 Map: King's Seat Hill (648m) should be positioned on the peak approx. 2cm north-east of it's current position. Acknowledgements Thanks to Stuart Fisher and Thomas Murray for pointing out errors in the first print run. Page 410 Col 2 6:3 Para 2, line 17: after “916m”: add “in Munro’s Tables but resurveyed in 2011 as 913.96m”. 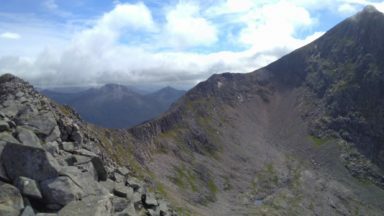 The caption for the frontispiece photograph opposite the Acknowledgments, should be "Sgurr nan Clach Geala from Carn na Criche in the Fannaichs". The Cairngorms National Park was enlarged to 4,528 km2 in September 2010 and now includes Blair Atholl, Glen Tilt, Beinn a’Ghlo, Glen Shee and Killiekrankie in the south-west of the region. 'The content of this book has been put together in a wonderfully effective manner. But the layout of the guide is superb as well. This is a book that should grace the bookcases of all hillwalkers and mountaineers that love the hills of Scotland. Six years in the writing, Chris Townsend’s Scotland is a hugely impressive piece of work. A man known for his long-distance walking exploits probably needed the same kind of fortitude to pull together this particular tour de force. What it does do brilliantly, is give you an idea of what's in the area, what your route options are and their highlights and attractions plus how long they're likely to take. It's a great way of short-cutting the learning process and, from a distance, of deciding whether you want to visit a particular area. Last but very definitely not least, the numerous colour images of the hills serve up information and inspiration in equal measure and really whet the appetite. Overall, Scotland is one of those books that you'll find yourself dipping into again and again both for concrete planning and for general inspiration. 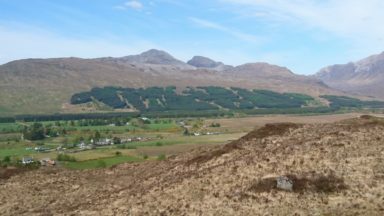 It's not just for novices either, there's so much to do in Scotland, that it's a brilliant way of researching the potential of areas you might know of, but don't know well, or just areas you've never heard of, full stop. A cracking book that should be on every mountain walker and mountaineer's book shelf. ...In conclusion, if you plan on any rock/ ice climbing, mountaineering, ski touring or hill walking in Scotland, for a daytrip or for a week or more, you should get this book. The knowledge and insider information in this book, together with the stunning photos and maps for planning, make the book mandatory for all those who plan to spend time outdoors in Scotland. “This book has been over six years in the writing...” states the author in the acknowledgments. Well, that’s rubbish for a start, and we’re only on Page Seven of this 550+-page tome. If you’ve read this issue’s editorial, you’ll be aware that Chris and I are old(ish) friends. I can therefore, I feel, vouch for the fact that this book is the fruit of a lifetime’s experience, knowledge and love of the Scottish hills. As a guide for mountaineers, walkers and backcountry skiers, it’s invaluable; as a reference for those who love some of the world’s finest mountains, it’s priceless; as close to definitive as you could wish for, and actually difficult to believe that every detailed sentence, every glorious photograph, is the work of one man. 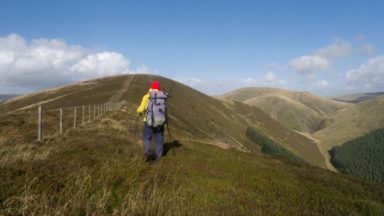 The hills are conveniently split into geographical chapters – similar but not identical to the regions used by the Scottish Mountaineering Club’s well- known District Guides – then further subdivided, with descriptions of hills, suggested walks, scrambles, climbs and ski tours, with the prime focus being on walking. Kudos to Cicerone for publishing a book with such a broad scope and for identifying its potential all those years ago, when work began. If you’re looking for poetic descriptions and flamboyant prose, then this is the wrong place. This is a reference book first and foremost, and the text is matter-of-fact; you don’t though have to read far between the lines to work out that only someone with a deep love and knowledge for this country could devote so much effort to revealing its secrets to others. high, which have been done this year in 39 days and 12 hours by Stephen Pyke, who used a bicycle and a canoe to reach some of them. The folklore and history is interesting. Indeed, the potted history of rural Scotland is as good as you will fi nd anywhere. Important ascents are recorded. Surprisingly, not only does Prince Charlie feature but Queen Victoria does so more than once. First ascents are usually noted and English translations given of Gaelic names. Maps make it very much easier to spot peaks and their heights than can be done by looking at the tangle of contour lines on OS maps. Finally, the book is designed with flaps to be used as page markers, one with the map symbols. This is a book for mountain visitors, rather more numerous than just mountaineers. Even if you don’t climb mountains there is an enormous amount of information of interest here for when you paddle past them. 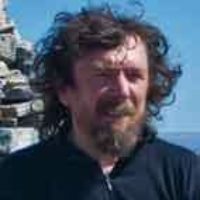 It’s difficult to think of anyone better qualified than Chris Townsend to write a comprehensive guide to the hills of Scotland. The sheet amount of information is mind-boggling, with enough suggested hill walks to last a lifetime. It’s good to see that some fascinating walks at lower levels included too. The design is fairly traditional, but is enlivened by some excellent photography. Rather than relying on sunny days, many of the shots convey the changing atmosphere of the hills in different weather conditions. The maps are clear and the text is bang up to date. Chris Townsend has somehow managed to shoe-horn a lifetime’s experience of Scotland into this book, and his love of the landscape shines through. Chris’s views on modern conservation, footpath building and windfarms are expressed with a light touch, leaving the reader wanting to think and find out more for themselves. If santa didn’t bring you this already, it’s an essential purchase. What struck me first were the wonderful photos, which either bring back memories or encourage one to visit that area. The book is also full of good advice. There are plenty of informative maps and the book covers every area of Scotland. The front cover photo invites one to open the book and see more, and to go there if you have not already, and once opened, the book is difficult to put down. Chris says it too him six years to write this book, which is not surprising when you see how much has gone into it, and I suspect that many hills will have been revisited to get photos in good light and conditions – it is excellent. Chris Townsend’s magnificent new book is a kind of milestone. It is part of a much praised resource series called ‘World Mountain Ranges’ and it is a truly a brilliantly researched volume. As well as being suitable for short outing it can be a planning tool for long distance treks. It is an ideal book for visitors to Scotland. There are excellent illustrations which catch the mood of the outdoor and hill world. ‘…illustrated with stunning photographic images. 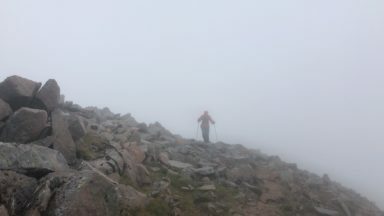 Chris Townsend writes every month for TGO and has written 19 books including Scotland in Cicerone's World Mountain Ranges series, the story of his hike along the Pacific Northwest Trail and an account of his continuous round of all the Munros in Scotland. His epic walks include the 2600-mile Pacific Crest Trail, 1600 miles along the Canadian Rockies, 1000 miles through the Yukon and 1300 miles through Norway and Sweden. He has led ski tours in Greenland and Scandinavia, as well as treks in Nepal. He is involved with outdoor and conservation organisations and served as President of the Mountaineering Council of Scotland.